Colors run across the color wheel. More traditional colors such as earth tones are popular as are navy, other shades of blue, citrus colors and black. Citrus colors are being used to jazz up otherwise more sedate spaces. 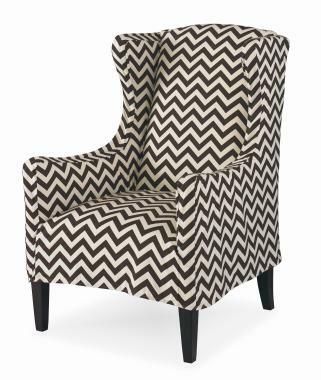 Most often the primary color is the predominant chevron design and is mixed with off white or cream but multi-colored chevron designs are also available. If you can’t see yourself committing to an entire piece of furniture in a chevron pattern, try a custom made shower curtain. Our drapery manufacturing vendor made this shower curtain out of a customers own material (COM). The beauty of custom is that you can choose any pattern, width and height that will specifically fit your space. You don’t need to make due with off the rack shower curtains that may be too short or skimpy.